A few weeks ago we published a story about the special El Paso County sales tax approved by the voters back in November of 2012 and referred to as 1A. This tax initiative is for 8 years and will expire in January 2021. 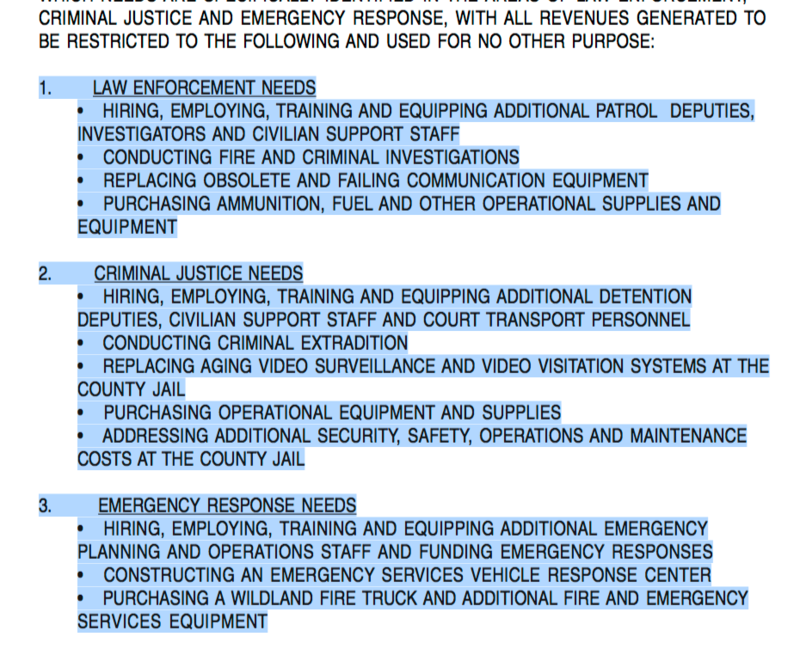 The goal of this tax was to put more “cops” on the street; help with manpower issues in the jail and courthouse; and enhance emergency services. Read the ballot wording. Does the tax initiative wording say anything about hiring more administrators who contributed to Bill Elder’s election campaign? Read full story. 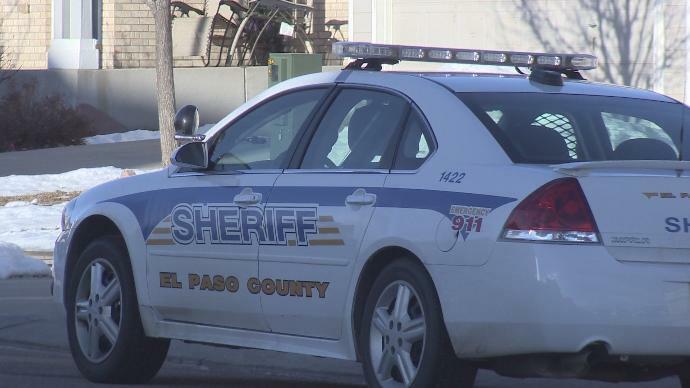 Documents obtained by “DirtyElder” clearly show the El Paso County Sheriff’s Office (EPSO), under Bill Elder’s leadership, have taken funds designed to put more cops on the street and have diverted them to allow Elder to hire additional administrators. Is he using a “shell game” with taxpayer money to accomplish his goal? Is he putting our community at risk so he can give campaign supporters “paybacks”? Could it be Elder doesn’t care because if his plan works out he will be a county commissioner? Someone else will be stuck holding the bag when massive layoffs will be necessary. 1A is over in about 3 years; are they planning on running into the brick wall at full speed? Are they going to demand the community continue the tax to fund his cronies? According to multiple patrol deputies there are less Deputies on the street today than before 1A was approved. One source told us they believe Elder switched to 5 shifts in an effort to “fool” the public and media into believing there are more deputies when there are actually less. The shift minimums are 5-6 cars, but rarely is there more than 5. Let’s keep it simple; back in 2013 the average shift had 6-7 cars. After 1A it went up to 10-12 cars a shift (3 shifts). It’s now down to an average of 5-6 cars a shift (5 shifts ). So do the math; 11X3=33; 5X5=25. The fact is there is an average of 5-8 less cars on the street per day than 2 years ago. A decrease of approximately 15-20%. But it’s actually worse; If you look at the shifts and staffing they have created a schedule that is dangerously understaffed during critical times if only 1 or 2 Deputies are out. Is Elder putting Deputy’s lives at risk? Does he care? These numbers can be confirmed by obtaining the patrol rosters for 2013, 2015, and present. Why is Elder in a panic over too much “comp” time? Could it be he knows he does not have the budget to pay it out? Plus, by forcing patrol Deputies to use comp time (so he does not have to pay them later) he is putting less cops on the street. The goal of 1A was to put more “boots on the ground”. It is our understanding most patrol shifts are going out at or below the minimums. The tax initiative was approved by the voters to put more resources into public safety, not administrators. Bill Elder is basically providing our community the same amount of protection we had 5 years ago but with millions more in funding. Thought he said he was going to spend our tax dollars wisely? Watch Video. Plus, there is ZERO transparency concerning the spending of the 1A funds. According to the wording in the ballot measure it specifically calls for the “SHERIFF” to provide yearly reports to the community and to hold a yearly public meeting. Read Ballot Wording. We can find no evidence that Bill Elder has ever provided any yearly reports to the public or held any yearly publicly announced meeting concerning 1A. Where are all the receipts showing the funds were spent according to the ballot wording? Based on the wording, should Bill Elder provide receipts for everything? We did find one document which was created by the previous administration. Where are the comparable documents for 2015, 2016 and 2017? Read the 1A report for 2014. 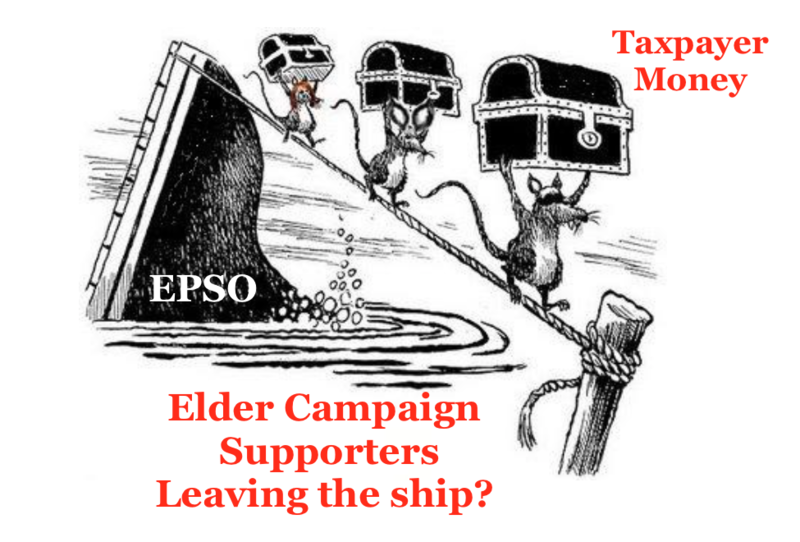 Is Elder breaking the law by not following the ballot wording which clearly states EPSO owes the community a yearly report and public meeting? Anyone can ask for the reports via a CORA request. Compare what they provide with the report from 2014. Which report fulfills the requirement? Where is the evidence that EPSO provided the community the report and announced the yearly public meeting? Just putting a budget document on a server is not good enough. There should be a TAB on the home page of the EPSO website entitled; “ 1A Financial Transparency Documents and Information”. Until this happens Bill Elder is not in compliance with the ballot initiative. How can Bill Elder afford to give all his campaign supporters highly compensated jobs? You can not pay them all using 1A funds; that would look bad. So, you change the budget to fund more sworn personnel with 1A funds and then use all the money freed up in the general fund to pay the 1.5 million you need for your buddies. 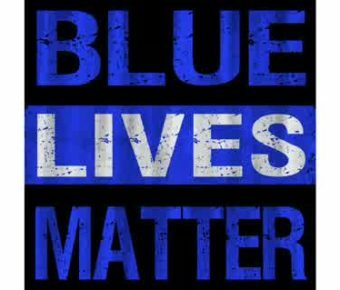 The problem is, when it all falls apart there will not be enough cops to do the job. Let’s review the numbers. It is clear the goal of 1A was to put more “boots on the ground”. Back in 2012, the taxpayers were told the money would not be used for supervisors or administrators. What has Bill Elder done with the money? 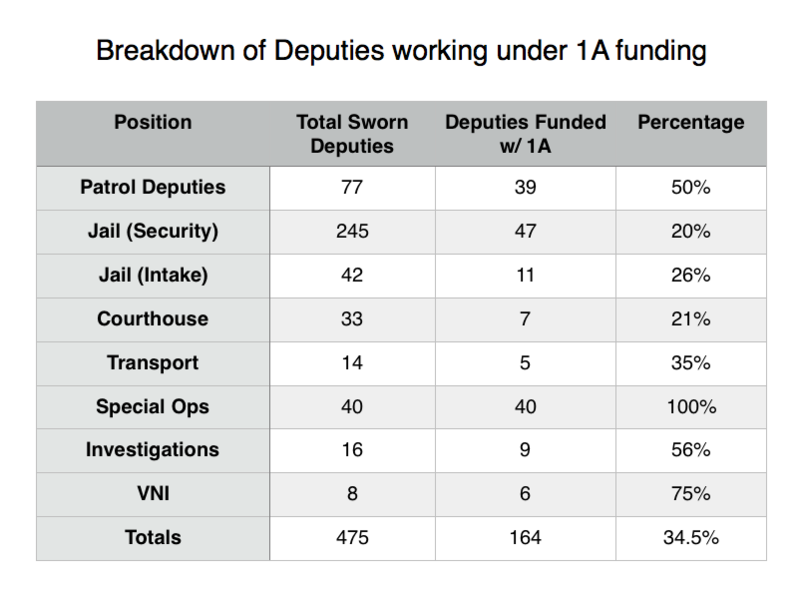 How many supervisors are being funded with 1A? Would you believe the number is 17? Of those 17, 11 are sergeants, 4 Lieutenants, and even 1 Commander. Based on the current salary schedule; 1.4 million a year of 1A taxpayer money is going to supervisors (administrators) not cops on the street. An inside source told us Deputies have been told there is no money for training, equipment, or overtime. Read the 1A ballot language again. Sounds to us the money was for these items. Why is there no money? Could it be Elder needs all this money to pay his campaign supporters? How does the “shell game” work? Easy, you fund more Deputies with 1A and use the freed up General Fund account to pay for your buddies. That’s why there is no funds for training, equipment, or overtime. All the 1A budget is going to manpower that use to be funded by the General Fund. He needs all that money to pay his cronies. Read the whole Story. How many administrative and supervisor positions has Bill Elder created? If 1A was to go away today; could the Sheriff’s Office continue to operate? Is Bill Elder violating the law by not providing the community a detailed 1A report each year? Should the media and our community demand full transparency concerning the spending of the 1A funds? How much equipment, training and overtime would 1.5 million a year buy? That’s how much Bill Elder is wasting every year on his campaign buddies. Is Elder putting Deputy’s lives at risk so he can payback his campaign buddies with big salaries? UPDATE (02/28/17): We received overwhelming amounts of feedback concerning this article. We were surprised that we were chastised by both patrol and jail Deputies that our article was too favorable to Elder. According to our new source, our estimates on how many cars are going out each shift was over stated. We wanted to give Elder the benefit of the doubt. Since our story, we were informed at least two shifts a day are going out with only 4 cars and they are lucky to have 5 on the rest. One source told us things have “NEVER BEEN THIS BAD” and they have created a dangerous environment for patrol deputies. Another fact brought to our attention; because they are so short handed in patrol everyone is going from call to call to call. Because of this they are getting backed up on reports. They are required to have all their reports done by the “end of the week”, so, Deputies have been working overtime on their last day to finish writing all their reports. Elder can’t handle overtime because he’s spending all our taxpayer money on his campaign buddies. So, they recently told Deputies no more; if they cannot keep up it’s their fault and they can write reports on their own time. FYI, this is against the law and opens EPSO to yet another lawsuit. It’s also another example of Elder’s corruption. Plus, it has been confirmed Deputies are being forced to take Holiday and Comp days in an effort to keep costs down. So, instead of using 1A funds to put more Deputies on the street the EPSO is sending cops home to save money so Elder can afford to pay his over compensated; under qualified campaign supporters their salaries. How does that make the citizens of El Paso County safer? 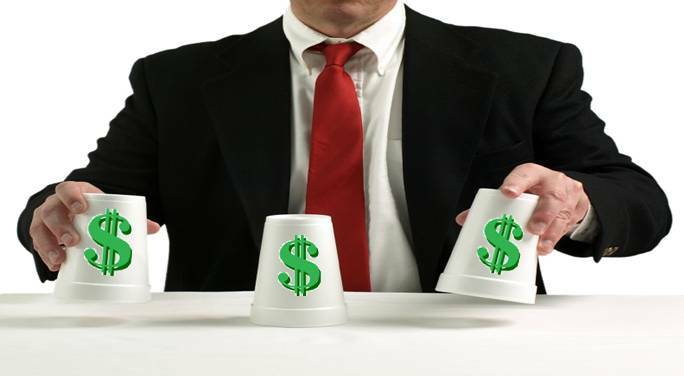 How about the Deputies who are working short staffed to support administrator salaries? We were contacted by Deputies at the Jail. They were upset because they are also at critical staffing and Elder is playing the same games there. We should have included them in the article. 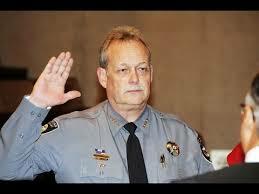 Which do you think Bill Elder cares about; protecting the community and his Deputies, or getting his money? Sorry for not being as accurate as we could have been and leaving Deputies working at the Jail out of the story. Thank you for what you do every day.